afterschool staff should not work with young people until they have been adequately prepared—which includes training in evidence-based practices—and properly supervised. On the other hand, it requires that scientists understand and study those aspects of afterschool programming most relevant to the needs of practitioners. 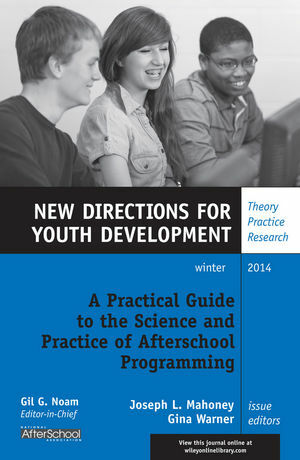 This volume includes perspectives from the afterschool workforce, scientists who discuss the current research, and the practitioners who know how afterschool programs operate in practice. This is the 144th volume of New Directions for Youth Development, the Jossey-Bass quarterly report series dedicated to bringing together everyone concerned with helping young people, including scholars, practitioners, and people from different disciplines and professions. Joseph L. Mahoney is a professor of psychology at Elizabethtown College. Gina Warner is the executive director of the National AfterSchool Association. Positive youth development can be promoted when strengths are aligned with contextual assets found in youth after school programs. A strong foundation has been built for the afterschool field to deliver high-quality services. This chapter describes different methods for assessing engagement and features of engaging afterschool programs. Adults working in afterschool settings must be able to engage youth in core components of productive adult–youth relationships. This chapter describes a proven approach to reduce or eliminate children’s problem behaviors in educational settings such as afterschool programs. Through research and practical strategies, this chapter demonstrates the powerful role afterschool programs play in addressing the need for a whole child approach to education. Afterschool program leaders must consider how to adapt their program to make it culturally relevant to the youth and families they serve. This chapter provides practical guidance on how to create an alignment between program and evaluation design that can help to foster desirable outcomes for the participants.